"If there’s one request we’ve heard over and over since launching Windows Phone last year, it’s this: More ringtones, please! I’m the program manager for the “sound experience” on the phone—everything from ringtones and alarms to alerts and key clicks. Today I wanted to take a minute to tell you about the ringtone-related changes in store for Mango, the next version of Windows Phone arriving this fall." The ability to personalise your phones has been one of the constants in the smartphone battles of the past decade, and the way your phone sounds has been on of the key ingredients of that effort. You could argue that Microsoft should have had custom ringtones higher on the priority list - heck, one of the first homebrew apps for WP7 was a custom ringtone loader. As late as it is, under Mango it looks like the Windows Phone team have thought this one through and added a bit more than just having the ability to load custom ringtones (and giving carriers another potential income stream). 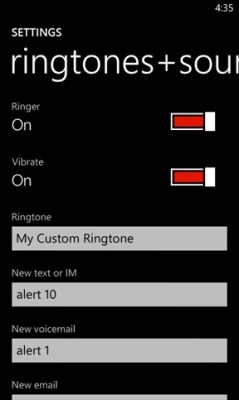 I want this, if nothing for the fact I can't use musical ringtones (which is what the stock WP7 ringtones are). They just don't register in my mind. I've missed way too many calls as it is already!